They'll arrive when they are good and ready. Usually we are alerted to the fact that the frogs have arrived by the sound of the males serenading potential mates. This year was different the first inkling was when, Martyn spotted some clumps of frog spawn. We were bemused by this as neither of us had noticed any frogs in the pond. Frog spawn without frogs was an impossible scenario so where were the frogs? 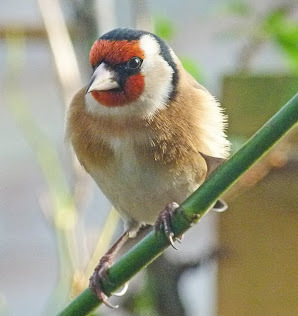 The morning after, Martyn was heading up the garden steps to fill the bird feeders when he nearly trod on something. There on the bottom steps were two amorous frogs. Scaling the steps up to the pond area seemed to be an impossible task for a frog carrying such a load so we decided to wait and see whether they moved. We decided to have an afternoon tidying the garden. When working by the pond, I heard the unmistakable plop but no frog was in sight. Later I spotted this individual on guard by the frog spawn. 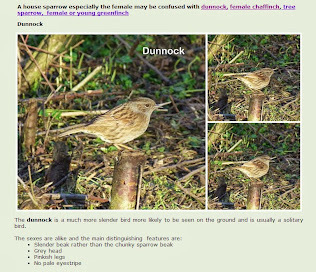 Was this one of the amorous pair? No they were still on the step. As they didn't seem any nearer to progressing up the steps and as we were going to be heading up and down the steps all afternoon meaning they were in danger of being trodden on, I decided to give them a helping hand. They were so enthralled in their passionate embrace that when I scooped them up in my hands the only movement was the stretching out of one back leg. I popped them on the edge of the pond and the next time that I looked they had disappeared, hopefully into the water. Last year I photographed frogs in the pond on 11 March so I had expected to see them earlier. However, in 2016 they didn't arrive until 2 April so I decided to check back a few years in my photo library. The times varied and so I decided to compare this to the average temperatures for each March and April. It would be more accurate to say the dates were when we first noticed the frogs as this year they obviously arrived before the frog spawn which was the first thing that we noticed. However, the chart shows our frogs can arrive anywhere between the first half of March and the beginning of April. 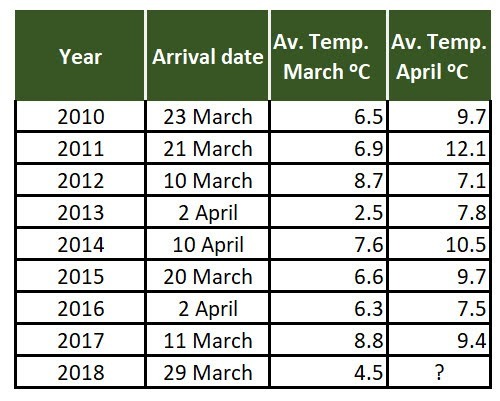 The two earliest arrivals coincide with a warmer March and generally speaking the later arrivals coincide with the colder March temperatures with 2014 bucking the trend. Not accurate science, I know, but it may be concluded that although the temperatures may have some bearing on spawning time that there are other things that can also come into play and the frogs will just arrive when they are good and ready. We actually managed to put three afternoons work into the plot this week. Amazing! Our main focus was on bed preparation and tidying. I tackled the perennial bed which needed a bit of weeding and the application of some fertiliser. Martyn tackled some of the beds that would be needed for our first lot of planting. Weed control fabric was removed and the edges tidied. Once the beds have dried out a bit - there's some overly optimistic thinking - the beds will be dug over and the weed control rotated to the appropriate bed. As the perennial bed only took me one afternoon, I moved on to the autumn raspberry bed. 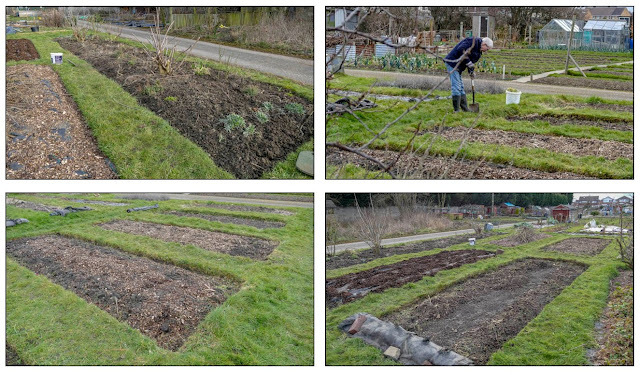 Martyn had already mulched the row of summer fruiting raspberries. I'm a bit worried about these as they don't like cold waterlogged soil. Our clay soil means that this winter these have just been the sort of conditions that they have had to put up with. 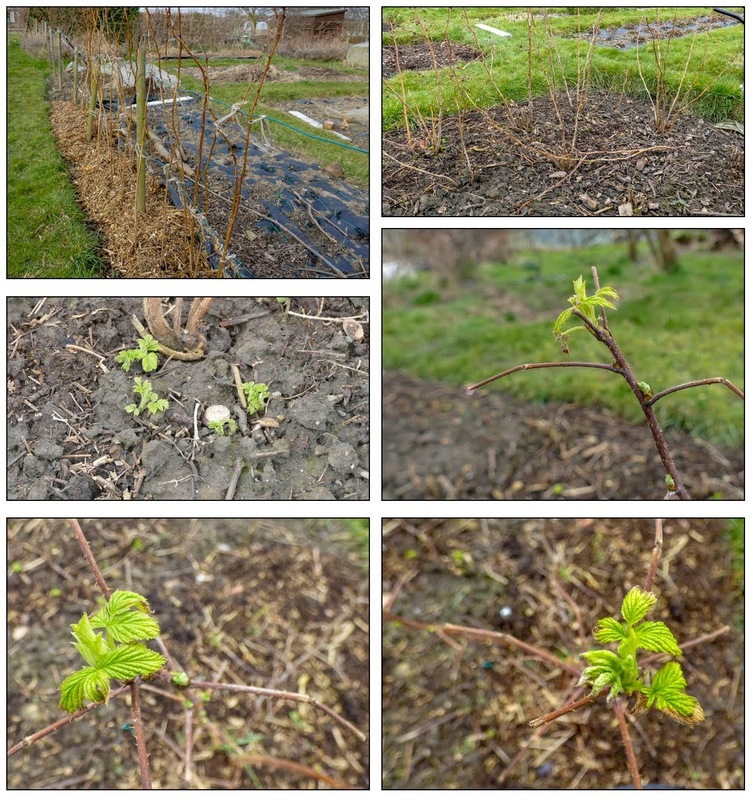 The autumn raspberries were producing shoots on the old canes and around the base of the plants. I know some people leave the old canes so they get fruit in summer and autumn but we don't. I cut the old canes down to the ground and then hoed and fertilised the bed. A mulch will be added later. There seems to be lots of shoots forming so if all survive, I'll cut some out leaving about three canes to each root. Unlike the summer fruiting varieties these shorter canes don't need tying. Another task was to trim the apple trees. The apple hedge had already been pruned in autumn so just needed a little tidying up. I also tidied a couple of other fruit beds. 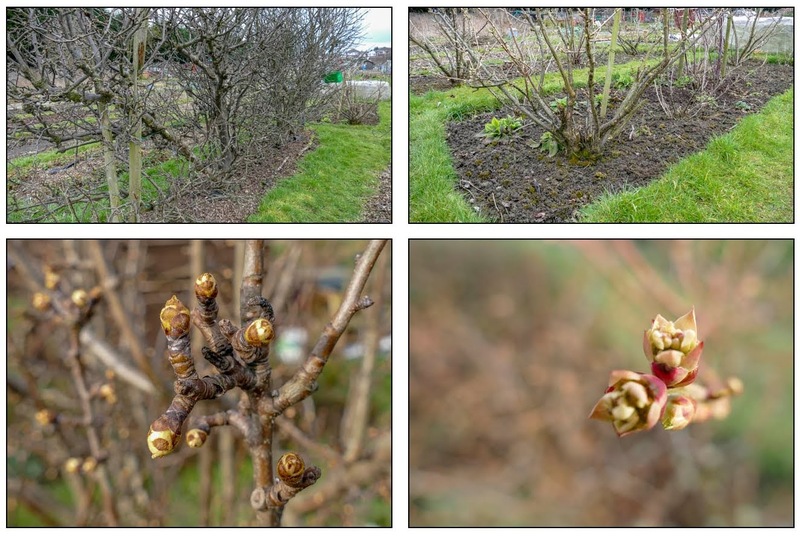 The buds on many of the fruit bushes are starting to swell so I hope that we don't have any more harsh frosts to spoil them. 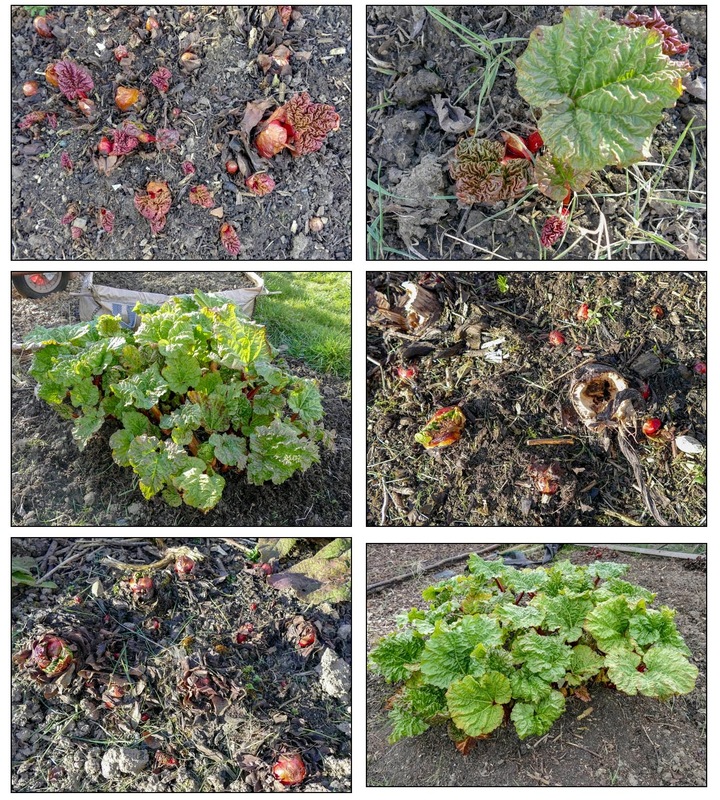 The rhubarb clumps are at various stages of maturity with a couple of early varieties nearly ready for cropping. As we plan another visit to the allotment today - Monday - we didn't do a major harvest, not that there is a massive amount to harvest at the moment. We did however, bring home a good picking of sprouts which were shared with my sister and still had some left. I'd hate for you to think that we ate all of these in one sitting. On Thursday, as compensation for all the bad weather that we have suffered recently, (and could suffered again as we still aren't out of the woods), we decided to treat ourselves to a garden centre visit. This wasn't just a local visit as the garden centre that we had in mind is on the far side of York so wasn't just a quick trip. One reason for choosing this garden centre was that it had a very good restaurant. Testament to this was the long queue of people waiting for a table. Queuing for food is too much like queuing for school dinners and so we decided to have a look around and then go home for a sandwich. Our first stop was the outdoor area where we were tempted by the display of herbs. It will be some time before our perennial herbs burst into action or the yearly sown ones produce usable leaves and so we decided to buy a mint, a parsley and a coriander plant. Next stop the houseplant section where my eye was drawn to a clivia. I knew clivias came in colours other than the more common orange, but had never seen any other colour for sale, so of course this plant just had to come home with us. You may have read in an earlier post that I gathered and planted seed from my orange clivia. Just as a quick update this is how things are progressing. The two seeds that had already produced roots are growing well but the third isn't doing anything at all. There are more pods ripening on the plant and I also had a go at pollinating the flowers on the new plant. Maybe if at some time both plants flower together I could try my hand at cross pollination. Still with the houseplants, I bought a Bird's Nest Fern to add to the group of ferns that we have in the bathroom. Next stop was the dahlia stand. We wanted a few more to pad out the perennial bed on the allotment as no doubt this winter will have claimed some victims. After much deliberation and tuber inspection we ended up with five. Martyn is convinced that we will have room for them - I'm not sure. The varieties are Babette, Sylvia, Paso Doble, Zingaro and Trebbiano. Last year our choices turned out not to match the photos on the packet so we will see what we end up with this year. Last stop was to find some small gardening gloves for me. It's surprisingly difficult to find small sized gloves. No doubt they think hands need to be a given size to garden. I ended up with two pairs. When we passed the restaurant we noticed that the queue had disappeared so we paid for our purchases and loaded them into the car before heading back for a late lunch of salmon fillet in a creamy sauce with seasonal vegetables. After that wallets empty and tummies full we headed home. ... and most of all Martyn and I are totally fed up of this appalling weather. When it isn't snowing or raining or just cold wet and miserable, the snatches of brighter weather are not effective at drying the soil on the allotment. It is too muddy and claggy to dig, weed, plant or anything else. After the few visits to the plot I have left at least an inch taller - courtesy of mud coated soles. As visits to the plot are few and far between, we are falling behind schedule as are the frogs that should by now have arrived in the garden pond! The birds have made a half-hearted attempt at gathering nesting materials but seem to have called a halt to proceedings. The annuals that you may remember that I sowed last autumn should have been planted out by now but are still languishing in module trays. The onions and shallot sets are still waiting to be planted in a bed on the allotment that has yet to be prepared. Last year we started half of the sets in modules but noticed little difference in them from those planted direct on the plot. We made the decision to forego the module stage but if this weather continues we may have to think again. The potatoes are chitting but still under fleece . We have managed some sowing though. Broad beans, leeks and lettuce have been sown and are sitting in our garden greenhouse waiting for a little heat to encourage germination. The trays each have a clear plastic lid covering them. We bought a set of lids last year as a last ditch attempt to protect the seeds from hungry mice. Maybe this year they may, when the sun deigns to make a brief appearance, also add a little extra warmth . A group of plants that are keeping to schedule are the fruit trees in the garden greenhouse. I posted about pollinating the apricot blossom in an earlier post. 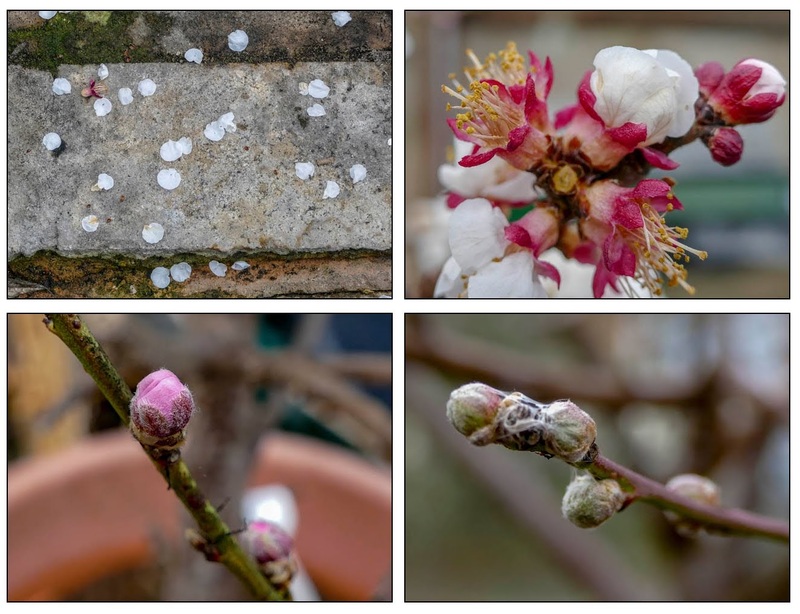 The apricot flower petals are now falling and green leaf shoots are beginning to appear but it is too soon to tell whether my efforts at pollination have been successful. Last to flower as usual will be the peach. At the moment its flower buds are tightly enclosed in green sepals. Sensible plant! So it's not really all doom and gloom just yet and at least here in the UK many of us are in the same boat. Let's all just put in a joint plea for real spring to show itself soon. 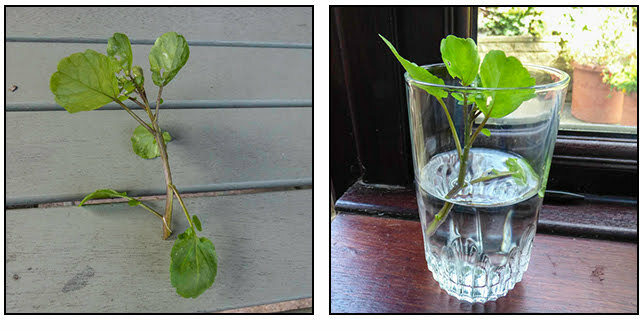 A few readers have asked me to write a post explaining how I went about growing watercress in our garden pond. 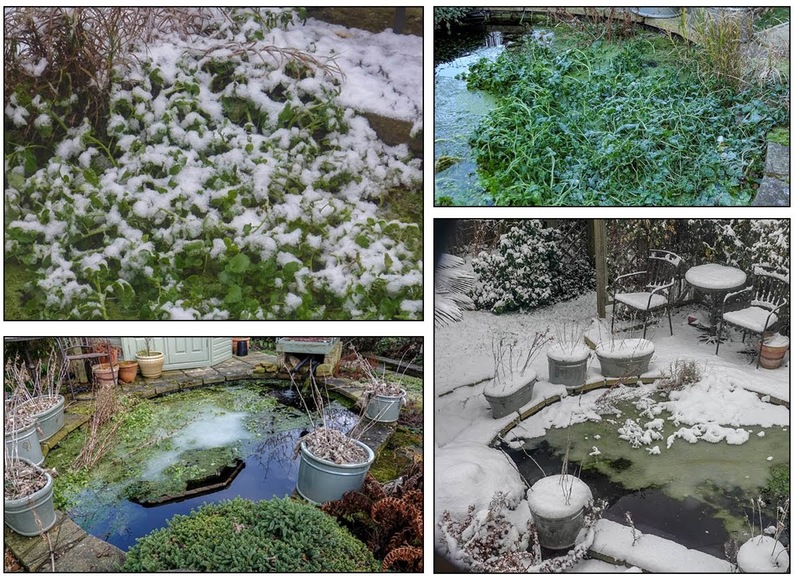 Maybe firstly I should describe our garden pond. It is approximately 4m x 2m (14' x 6½') and at its deepest is about 1.5m (5') deep. Fish live in the pond although at the moment you wouldn't know it as, during the winter months, they rather sensibly lie low. As soon as the temperatures warm they will be back begging to be fed every time we are by the pond. Who says fish have no memory? The pond is filtered for the benefit of the fish. I don't know whether any of the above affects the growth of the watercress but I do know others have grown watercress in smaller, unfiltered ponds and, like Mark, even in tubs of moist soil. The following describes what worked for us and in no means is the only way to grow watercress. Maybe others can describe how they achieved success in the comments. We bought a bag of watercress from the greengrocer. I placed just one piece in a glass of water. 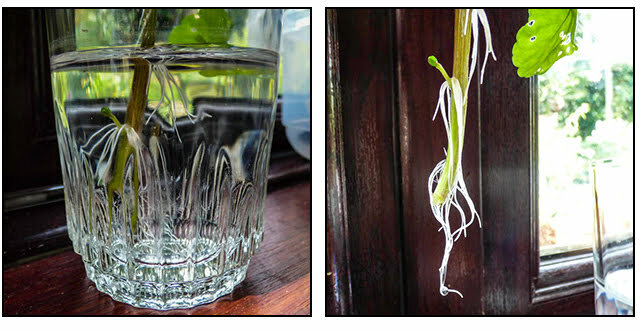 The roots quickly developed and within three days there was a good root system. Previously we had placed a pond basket in the pond to protect some frog spawn from the fish and so we decided to pop the sprig of watercress into the confines of the basket in order to stop it floating away. Shortly after planting or rather throwing in the pond the sprig of watercress looked rather sad and we decided that it was just going to die. We ignored it so there are no photographs. Surprisingly after an unpromising start, the tiny shoot must have settled in to its new home and we ended up with a huge watercress patch. It quite rapidly made its way across the pond and also the surrounding paved area. To avoid it taking over, Martyn had to keep removing huge amounts of it. He has literally removed bucketfuls. Imagine the value of that lot in supermarket terms. I wasn't sure how long it would survive over winter but it has kept going through one of our worst winters for quite a while. During the freezing, cold, snowy spell at the end of February and the beginning of March the temperature dropped to -5.8C (21.6F). For 10 days the temperature never rose above freezing. Today (15 March), after having taken all that the weather has thrown at it this winter, the watercress is looking like this. It looks fairly battered and worse for wear but it seems alive and still in need of some drastic cutting back. If it turns out that it doesn't survive we will certainly be repeating the process this year. 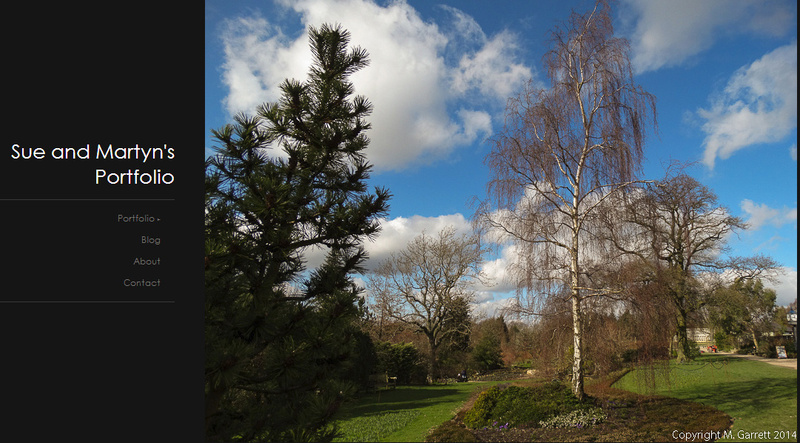 We're glad that the snow has gone!